The Cylinder Leakdown Test Kit for Weber engines is the fastest and most accurate method to test and verify the condition and performance values of four stroke cylinders, pistons, intake, and exhaust valves. 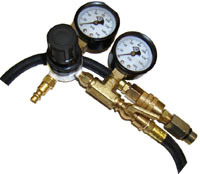 The Cylinder leakdown Kit is designed for the smaller 4-stroke engine platform, and is more accurate than most "automotive" style gauges. The percentage of leakdown will instantly be displayed on the gauges. Accurately test for cracked or detonated pistons, leaking ring sets, and leaking intake or exhaust valves. The Leakdown Test Kit is accurate, fast, and efficient. The kit comes complete with instructions and the 14mm thread adapter necessary for the Weber engine, but optional adapters are available for motorcycle & marine applications.